That was quick! I guess crowdsourcing really does work. Thanks, reader Maya H., of Hyde Park, for identifying Eva Morrison. According to this vintage postcard, Morrison is "the only woman in the world to make the Boston Light swim and return of 3 miles." Eva Morrison of Roxbury MA was a prominent distance swimmer in the 1920s, best remembered for making a record-breaking time in the Boston Light Swim, and training to swim the English Channel at the same time as Gertrude Ederle did. She served on the initial Board of Governors for the International Professional Swimmers' Association when it formed in 1927. Morrison was inducted into the International Marathon Swimming Hall of Fame in 1973. 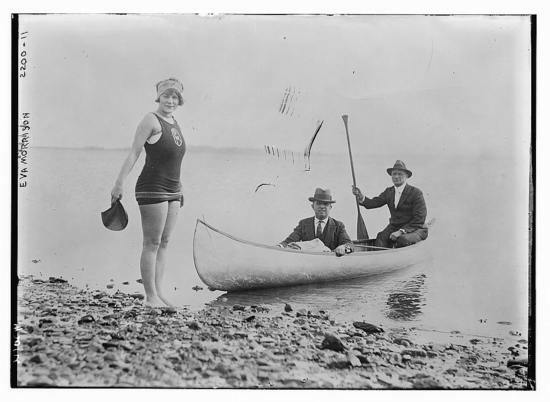 My Mother, Frances Vincent Portalla, won the Boston Light swim in 1927 at the age of 16. 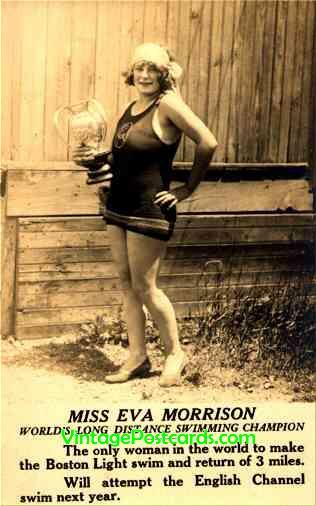 Eva Morrison did not win the the boston light swim in 1925. Irene Hessenius did and I have the trophy to prove it. Irene swam the boston light in 7 hours and 9 minutes and Eva came in 59 minutes after her. Sam richards, Eva's then pilot, left Eva during the swim to pilot Irene because Eva wouldn't follow his instructions. I have the original newspapers showing both swims and Irene Hessenius clearly one. We have the James Curley Trophy engraved with the date and her name to prove it. I had an aunt who spoke of a cousin ,Robert Stafford,who swam the boston light swim in the 1920s.She said," he developed a cramp and drowned". Can this be verified? eva morrison was my grandmothers sister and my father has gave me several articles and pictures on her if any one is interested ? I am writing the 196 biographies of the individuals currently inducted in the International Marathon Swimming Hall of Fame on behalf of the International Swimming Hall of Fame. Eva was inducted in 1973 as the article states above. Any additional information, photos or items that you wish to donate or inform us would be greatly appreciated. Eva's background greatly helps us to document the history of marathon swimming. The organizers of the Boston Light Swim are updating the History page on the web site. If any of you have old newspaper articles, photos, etc. please contact us.